Assassin\'s Creed: Brotherhood is an action-adventure video game with main emphasis on nonlinear gameplay, sandbox style gameplay, parkour movements, crowd-blending stealth, assassinations and melee fighting system. The combat system features several improvements and for the first time in the series, the game offers a multiplayer mode alongside 15+ hours of single-player gameplay. The ezio assassins creed is still one of the best. The story is great and the combat to. 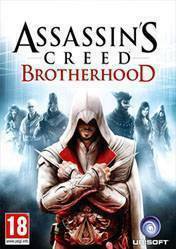 Really recommend to play this one and the other 2 ezio games.